Come celebrate International Women’s Day as French soprano Sérine de Labaume and well-decorated pianist Elena Kim celebrate their 15 years of collaboration and friendship through music! One evening with French and Korean art songs and another with Opera Arias. A musical journey through Pauline Viardot, Isang Yun, Léo Delibes, Erik Satie, Francis Poulenc, Donizetti, Verdi, Puccini, Strauss, Gounod, Bernstein… Presenting two entirely different programmes for the two evenings this March 7 and 8, the two performers invite you to explore a vast range of emotions with two very versatile instruments: voice and piano. The first evening, Thursday March 7th’s programme comprises of art songs in four segments; 1st, Art of Pauline Viardot. 2nd, Cabaret & Theatre. 3rd, Korea; tradition and modernism. 4th, Andalusia, French interpretation. On the second day Friday March 8, the opera aria evening will explore two contrasting portrayals of operatic heroines; victims vs victors. 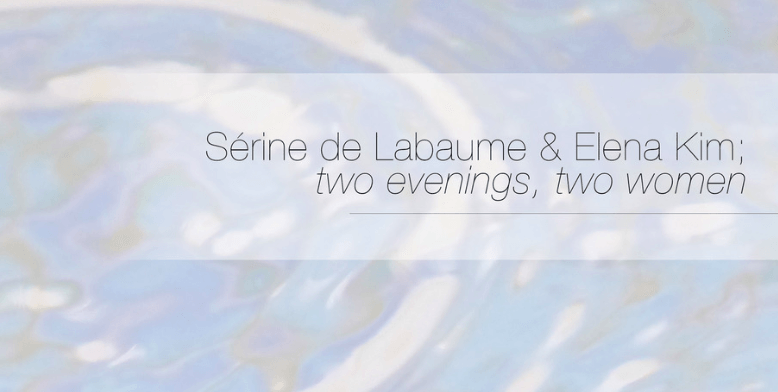 Sérine de Labaume began her musical training at the age of 4 with the violin. She studied voice with Mireille Alcantara in Paris, Jenny Anvelt in Milan and Rivka Or in Aachen. Mainly appearing in France, Belgium, Spain, Italy, South Korea and Singapore, she has also sung in Germany, Finland, Sweden and Japan. An accomplished visual artist, she has a Bachelor’s degree in Studio Art and a Master’s in Environmental Art from New York University. Sérine de Labaume works with mixed media and has exhibited her works through solo as well as group shows in the USA, Italy, France, South Korea and Singapore. As the artistic director of Brownhill Consultancy in Singapore, she has curated several exhibitions, concerts and festivals including the “FreshAir Fine Arts Festival” 2013/2014 and “Wo Men Women” 2014/2015. Elena and Sérine met in Barcelona, Spain in 2004. Since then, their lives have crossed one another’s path in cities and towns of Italy, France, South Korea, and finally, Singapore. Their friendship and musicianship fueled by their unfading love for music made their numerous collaborations possible, including many impromptu appearances such as these recitals. More information about the concerts here.